Tottenham’s title challenge was dented last time out when they salvaged a 1-1 draw against Liverpool at Anfield. A point gained or two points stolen? The game could have gone either way for both teams, so neither side should feel thwarted with the result. Leicester did go on to beat Southampton later that day, which means Spurs are now seven points behind the leaders with just six games to go. Tottenham could look back to the 2011/12 season as inspiration where Manchester City were eight points behind Manchester United with eight games to go, but then went on to win the title on the final day of the season. So anything is still possible for Pochettino’s men. This fixture hasn’t been a delight for Spurs, though, with Tottenham winning just twice in their last 33 games against United. In fact, Spurs have never beaten the Red Devils at White Hart Lane, and have failed to score against them in the last three meetings. Astonishing, right? But Spurs are a different side now and have the likes of Harry Kane up front. Nicknamed the “HurriKane” – the English striker has blown away any thoughts of being a ‘one-season wonder’ and is the league’s leading goalscorer with 22 goals to his name. Kane’s goal against Liverpool was the most ever scored by a Tottenham player in one Premier League season. Now how was that to prove doubters wrong? Kane then revealed what Jurgen Klopp said to him after the game. And as expected, the Liverpool boss was full of praise and said just three words. You know, those three words that every striker wants to hear – what a strike! Along with Kane, Spurs have another Englishman in their attacking force. Dele Alli arguably deserves the Young Player of the Year award this campaign and has been frightening for opposing defenders. Alli has heaped praise of Pochettino time and time again this season and has reiterated that he has no problem playing anywhere. Whether it be on either flank, or in a No. 10 role, Alli has the ability to drive the ball forward, take on a player or two and has a wicked shot which has not gone unnoticed this season. Apart from the dangerous duo of Kane and Alli, Spurs have scored 21 goals from set-pieces this season – the most in the league. But you just cannot rely on a corner or free-kick to separate this match. Spurs certainly have the firepower to hurt any team on their day. And in the red corner! Manchester United go in search for a third consecutive victory in the league. Two weeks ago, looking at United’s run in the next few games, nobody would have expected van Gaal to still be in charge at the end of it all, when they had to play local rivals Man City, and then Everton – who they beat both games without letting a goal go past them. Successive clean sheets is definitely what you need heading into a clash with Spurs. Tottenham boast the best attack at the moment with 57 goals to their tally, so United will have to be rock-solid in hope of stopping Spurs’ firepower up front. David de Gea has been Man United’s stand-out player this campaign after his move broke down to join Real Madrid in the beginning of the season. De Gea has been in exceptional form, helping United keep 15 clean sheets this season – the most by any club in the league. It’s obvious that you cannot lose if you don’t concede, but its goals that win you games. Anthony Martial and Marcus Rashford have produced the goods for United in recent weeks, which has seen most fans even forget the absence of Wayne Rooney. However, England’s record goalscorer could make the squad for this tie – or at least be on the bench. What an attacking trio it would be for United, to have the experience of Rooney, along with the pace and trickery of Martial and Rashford up front. 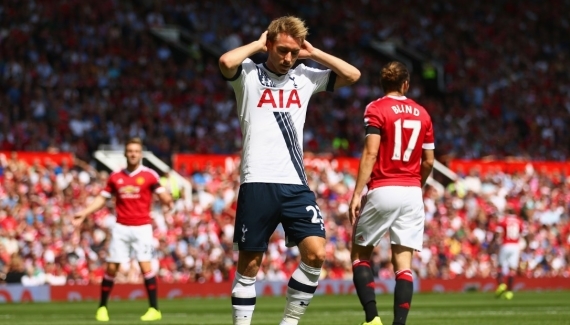 Spurs could be in for a rude awakening if the Red Devils set out their best line-up. Rashford has been in van Gaal’s starting 11 for nine consecutive matches – a chance Angel Di Maria wasn’t even given in a Manchester United shirt. It’s no secret that van Gaal has faith in his youth. Rashford tends to raise his game in the big matches, which has seen him score a brace against Arsenal on his Premier League debut, and the only goal in the Manchester Derby. Scoring against Spurs would be the icing on top of the cake. A win here would certainly take United one step closer in the chase for a top four spot. Lloris; Walker, Alderweireld, Wimmer, Rose; Dembele, Dier; Alli, Eriksen, Son; Kane. De Gea; Darmian, Smalling, Blind, Rojo; Schneiderlin, Carrick; Lingard, Mata, Martial; Rashford. As much as Tottenham seem to be gunning for their first Premier League title, their recent form hasn’t been the greatest with Spurs winning just twice in their last five matches – a 2-0 victory over basement-dwellers Aston Villa and a 3-0 win over newcomers Bournemouth. The Red Devils seem to have the upper hand over the past few years and have proved to be a bogey team for Spurs. United beat Tottenham on the opening day of the season by a 1-0 scoreline and are tipped to get any sort of result here. Three wins in as many matches is not impossible for the Reds. Play it safe though, and back them on the Double Chance at 15/20.